Although gelcoat doesn’t offer much in terms of structural value, it gives your boat it’s characteristic hue and shine. Not only does gelcoat give your boat a distinctive look, but the gelcoat also helps to protect the underlying fiberglass structure of your boat from water intrusion. A strong and durable material, gelcoat holds up pretty well over the long haul, but it will experience weathering over the years. It doesn’t matter how well you care for your boat. Eventually, the hull and the gelcoat which covers it will collect dings, nicks, and scratches. Older boats are prone to spider cracks that you can sometimes hear cracking as the boat ages. 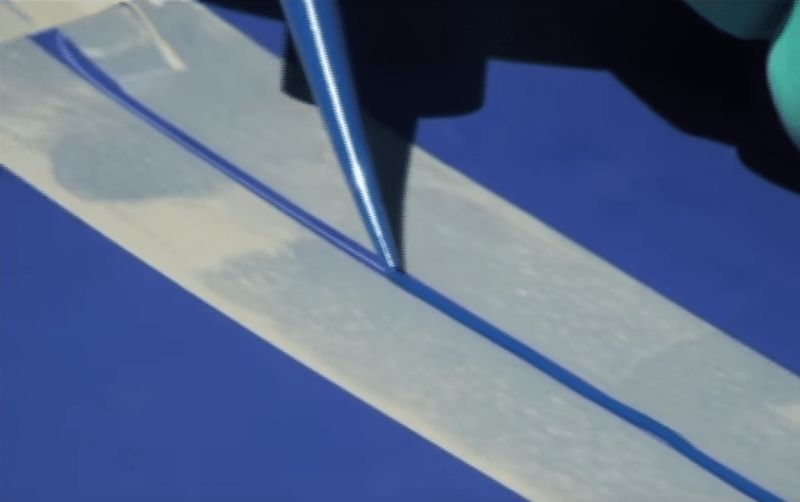 Most of the time, these are superficial and cosmetic in nature, and it’s possible for you to fix your boat’s gelcoat yourself. In today’s article, we’ll give you a few tips for how to safely repair boat gelcoat. If your boat is new, your best bet is to go straight to the dealer and see if they can give you a matching gelcoat. Older boats tend to be weathered, and a dealer-supplied pigment probably won’t match. You can purchase a kit with dyes you can add and mix to gelcoat resin for a close match. There are also companies that allow you to supply a sample of gelcoat and they can match your boat’s gelcoat for you. Once you have the correct pigment for the gelcoat repair, your next step is to use the rotary grinder and smooth down the edges of any scratches, or you merely need to sand the surface area. Wear a dust mask and safety glasses when sanding and grinding down the damaged surface of the hull. If you’re dealing with a series of shallow spider-like cracks, it’s possible to sand down these mild cracks with medium-grit sandpaper. Deeper gouges will require a more substantial process. If you’re dealing with gouges and holes, you’ll want to sand them down first before grinding out the cracks with a rotary grinder. You’ll want to smooth them to a 45-degree bevel and be careful to get rid of any loose material around scratches to ensure a smooth finish. If you are attempting to repair holes from old fasteners, the area around the opening is probably elevated from the pressure of the drill. What you can do to even out these areas is to use either a rotary file and a drill motor or a countersink bit to even out the raised area around the hole. With the putty knife, scrape away any loose material and then use an acetone-soaked rag to clean it of debris. Your next step is to tape off your repair areas with blue painters tape. Be sure to leave about 1/16 of an inch of margin around the repair area. It’s also a good idea to use the tape and mark-off other parts of your boat that you want to protect from resin droplets or sanding. Once you’re finished with the tape, clean the repair area with acetone again. Next, you’ll mix the gelcoat with a hardener or catalyst. Depending on the manufacturer, the exact formula will differ. Make sure you’re using the correct formula for your particular gelcoat resin and hardener. Use nitrile gloves when mixing with a stir stick and make a large enough batch for your entire gelcoat repair. That way, the areas you’re repairing will cure at the same rate. Smoothly spread the gelcoat over the repair area with a putty knife. You have about ten minutes to apply and smooth over the scratch before the catalyst starts to harden the gelcoat and you can’t work with it. Remember, you will be sanding over the repair area, so you’ll want to apply and smooth over the gelcoat so that it is a tiny bit higher than the surrounding surface of the hull. Once you’re finished applying and smoothing the gelcoat, spray the repair areas with a PVA curing agent. The curing agent will take about fifteen minutes to dry. When it is dry, you’ll peel it off. Next, you’ll take a 320-grit wet/dry paper and sand down the cured gelcoat with a sanding block. Then use the 600-grit paper until the repair area is almost even with the rest of the hull. Finish up with the 1,000 grit paper. Finally, buff the freshly repaired and sanded areas with rubbing compound, then apply a coat of boat wax. Once you’re finished repairing the gelcoat, you’ll not only have made your boat look brand-new, you’ve extended its lifetime. So, take a minute to step back and admire your work!